Director John Sturges and his crew arrived at Geiselgasteig Studios in rural Bavaria in April 1962. Art director Fernando Carrere immediately began designing the tunnel sets on the studio's sound stages. They were constructed of wood and skins filled with plaster and dirt and open on one side with a dolly track running the length of the set in order to shoot scenes of prisoners scooting along through them. In July, Sturges showed the rushes of the first six weeks shooting, and McQueen decided his part was minor and undeveloped. He was particularly upset that his character virtually disappears from the film for about 30 minutes in the middle so he walked out demanding rewrites. Sturges admitted the half-hour gap was likely a problem, but with the production already behind schedule due to the heavy rain, he felt he couldn't take time out to do rewrites and rescheduling. Co-star James Garner said he and cast member James Coburn got together with McQueen to determine what his specific gripes were. 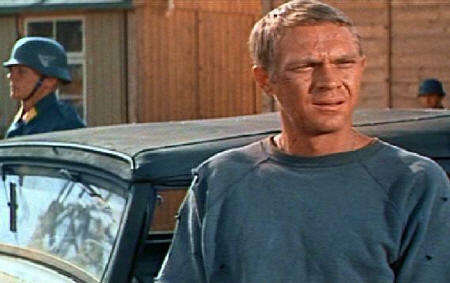 Garner later said it was apparent McQueen wanted to be the hero but didn't want to be seen doing anything overtly heroic that contradicted his character's cool detachment and sardonic demeanour. At the same time, McQueen never really liked his character's calm acquiescence to his time in the cooler or the famous bit with the catcher's mitt and ball. Sturges considered writing the character out of the story altogether, but United Artists informed him they considered McQueen indispensable to the picture's success and would spring for the extra money to hire another writer, Ivan Moffit, to deal with the star's demands. McQueen returned to work. 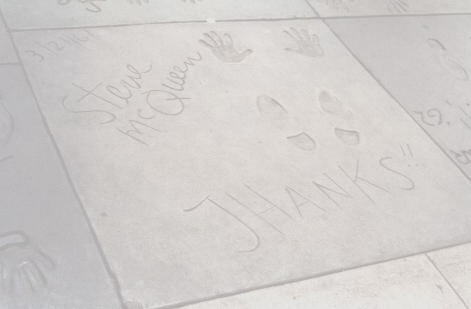 Reacting to McQueen's walkout, cast member Donald Pleasence later said, "I hadn't realized things like this go on in Hollywood, being an obedient English actor from the theatre mostly." McQueen reportedly rarely mingled with others away from the set, preferring to stay in the chalet he rented for himself and his family and travelling to the set each day in a chauffeur-driven limousine. Although McQueen was an expert motorcyclist, the major stunt of jumping the barbed wire fence was considered too risky by the studio for a star of his calibre, so a friend of his, Bud Ekins, was hired to perform the shot. Before leaving for Germany, Ekins bought two Triumph motorcycles and converted them to look like authentic German bikes of the period. The German National Railroad Bureau co-operated with Sturges' production to provide trains and logistics for the railway escape sequences. Platforms were fitted on passenger cars to accommodate huge arc lamps to illuminate the train interiors. On one flat car, a large Chapman crane was set up to swing out over the passenger car and film the jump from the moving train performed by two stuntmen disguised as Garner's and Pleasence's characters. The bureau attached a special radio operator to the crew to alert the train engineer to any potential traffic on the main line. The shooting schedule was squeezed in between actual runs on the rails. The bureau gave the production certain times and lengths of tracks to work on until a passenger train was scheduled to come by; the film train then had to duck onto a siding until the other passed.